outside my window... the sky is gray and the wind is blowing the new green leaves on the tree and the last of the pollen is falling to the ground. i am thinking... about all the mess in my house! with a new baby and 4 other kiddos, things get messy very quickly. i am thankful... for my new little hosea justus. he is such a sweet little baby and is fitting into our family so nicely. remembering... to give thanks for all the Lord has given and is giving me. i want to live from a thankful heart. from the learning rooms... right now we are working with david (4 years old) on learning the very basics of reading 3 letter short vowel words. he wants to read so badly and is ready already knowing all his letters and sounds. bill found a great little game on his ipad for david to play that practices blending 3 letter words... i think we will have a 3rd amazing reader in no time. from the kitchen... we have been incredibly blessed by friends and family bringing us meals to help the adjustment to the new baby in the family. our refrigerator is full of leftovers that i have been eating for lunches quite happily. i am simmering on the stove a stock pot of new chicken stock getting ready to fill the freezer so it will last hopefully through a good chunk of the summer. we are still enjoying our csa produce boxes and finding ways to get lots of veggies into our diets. i love trying veggies i wouldn't normally buy in the produce aisle and experimenting with new recipes. i am wearing... a long sleeved black shirt and jeans. it is supposed to rain today and be in the mid-sixties. i am creating... the cutest baby legs for a gift. 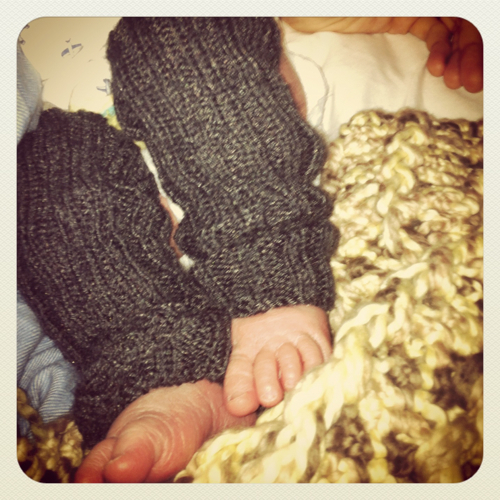 i made some for hosea that are very boyish and i love putting them on him with a onesie - makes for easy diaper changes. i am thinking about listing some in my etsy store. would you be interested if i did? i am going... to an appointment with my midwife today. seems a bit early for an appointment to me, but i guess she likes to do 2 postpardum appointments. i am reading... a book called poised for harvest, braced for backlash by timothy miller. great book so far that is sort of an autobiography of his overseas missions and sort of a teaching book on what is the gospel. i am hoping... to settle into life routines again soon. the transition with a new baby always adds so much and subtracts energy! i am hearing... hosea's cute little sounds. around the house... is a bit of a mess. okay, so it is more than a bit! i am glad you can't see through the computer screen into this room! one of my favorite things... is a new baby. i love their sounds, cuddles, newness... hosea is so fun right now! pondering... how to grow in perseverance in prayer. a few plans for the rest of the week: we are going to the lake on saturday to celebrate my birthday (a bit early) with my family. it is supposed to be a beautiful day and i kinda have a lake bbq birthday tradition.